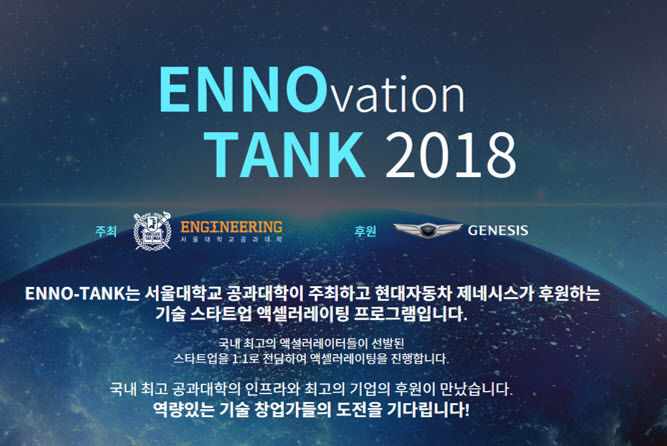 On May 14, the SNU College of Engineering announced the initiation of its ENNOvation Tank 2018 (ENNO-TANK) startup accelerator program sponsored by Hyundai Motors Genesis. The program is recruiting domestic startups in their ‘pre-seed’ stage, or previous to their having received any investment. Prospective startups founded within the past three years in the fields of Big Data, Artificial Intelligence (AI), robotics, Blockchain, 3D Printing, materials technology, biotechnology, financial technology (FinTech) and medical technology (MedTech) are eligible to apply. Five startups will be chosen to participate in the program, which will be led by five domestic startup accelerators: TheVentures, Venture Square, Blue Point Partners (BPP), N15 and Spring Camp. After a three-month period, one of the five startups will be selected to receive intensive one-on-one mentoring from the five accelerators. The selected startup will also be granted 10 million won and the opportunity to promote their products and services to investors and media outlets on Demo Day, an exposition of startups for potential investors scheduled for December this year. The SNU College of Engineering has also formed its own mentoring group to assist the startups in the program. The SNU College of Engineering and the five startup accelerators will train these startups in commercialization, acquisition of investments, equity management and communication and response skills with regard to legal issues.